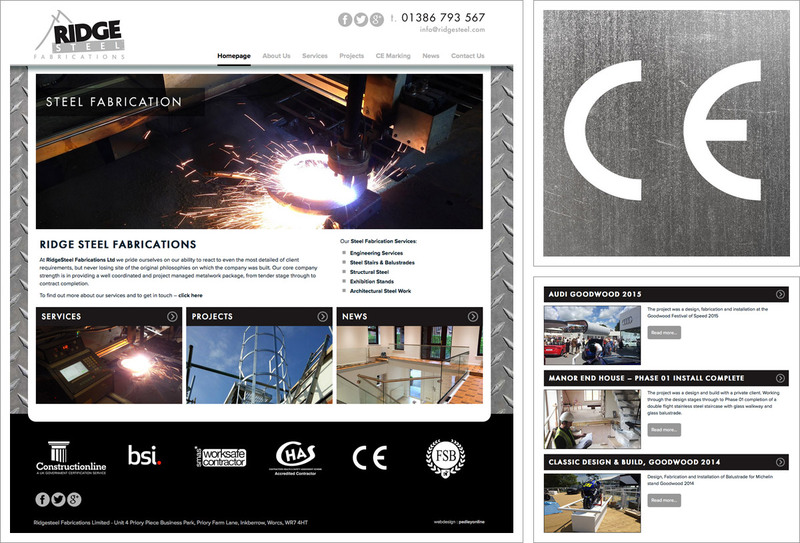 A large portfolio, brochure style website for Ridge Steel Fabrications which showcases their services, works in progress and completed projects. The site is professional, informative and interesting, particularly the Latest Projects and News section which features live and completed projects and includes images and accompanying text content. There is a main Services page with further subpages providing more detail for each area e.g. engineering services, exhibition stands, structural steel, architectural work etc. Extensive background information, certification and accreditations.Impressive imagery, dynamic content on the home page with a changing image holder. Horizontal navigation menu and alternative navigation options supplied through use of image panels and graphics. We worked with Ridge Steel’s distinctive company logo and added a steel checker plate background to complement it.